Hi,the nxhtml helps a lot. But seems there is some problem,I found a line “File mode specification error: (void-function rails-minor-mode)” in the *Message* buffer,why? Thanks Pluskid for your kindly reply! Yes I finally found the reason,and now installed emacs-rails extension,and ecb/cedet,it seems wonderful to develop rails application with Emacs now! You are welcome! Hope you enjoy it! which is an interactive compiled Lisp function in `indent.el'. It is bound to . Indent line in proper way for current major mode or insert a tab. Depending on `tab-always-indent', either insert a tab or indent. the indentation. Else stay at same point in text. 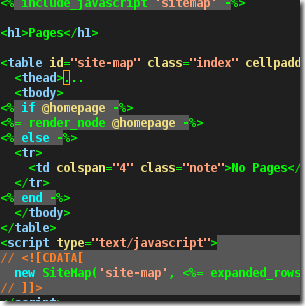 Major mode for editing XHTML documents. To see an overview in html format do M-x nxhtml-overview. associations are done, see `nxhtml-auto-mode-alist'. added to the [apps] key. - It can in some cases give assistance with attribute values. * You can use a menu popup style completion. * You can have alternatives grouped. * You can get a short help text shown for each alternative. for example) you will be prompted for an alternative action. C-c C-h v paste this as an a-tag. Toggle incremental minibuffer completion for this Emacs session. appears in the mode line. Toggle display of a menu bar on each frame. turn on menu bars; otherwise, turn off menu bars. Recognizes certain parts of a buffer as hyperlinks. The hyperlinks can be hilighted when the point is over them. the RET key commonly used in web browser to follow a link). `mlinks-forward-link' will take you to the previous/next link. With prefix argument ARG, turn on if positive, otherwise off. Return non-nil if the new state is enabled. Minor mode to turn on some key and menu bindings. See `nxhtml-mode' for more information. With arg, turn Outline minor mode on if arg is positive, off otherwise. See the command `outline-mode' for more information on this mode. Turn directory tracking on and off in a shell buffer. feature - see the function `dirtrack-mode'. With prefix ARG, turn Show Paren mode on if and only if ARG is positive. Returns the new status of Show Paren mode (non-nil means on). in `show-paren-style' after `show-paren-delay' seconds of Emacs idle time. Toggle display of a tab bar in the header line. Returns non-nil if the new state is enabled. With ARG, turn Tooltip mode on if and only if ARG is positive. in a pop-up window for buttons and menu items that you put the mouse on. the help text in the echo area, and does not make a pop-up window. With arg, turn Transient Mark mode on if arg is positive, off otherwise. In Transient Mark mode, when the mark is active, the region is highlighted. Changing the buffer "deactivates" the mark. M-;, M-x flush-lines, M-x keep-lines, M-%, C-M-%, M-x ispell, and C-_. commands which are sensitive to the Transient Mark mode. Set up translation-tables for unifying ISO 8859 characters on encoding. can cope with separate Latin-1 and Latin-9 representations of e-acute. e-acute in a Latin-1 buffer. Toggle whether UTF based coding systems de/encode CJK characters. zero or negative. This is a minor mode. decode the corresponding unicodes into such characters. Chinese-Big5 and jisx for other environments. positive prefix argument turns on the mode. Negative prefix argument turns off the mode. expands snippets of code depending on the mode. You can customize the key through `yas/trigger-key'.